The Vancouver restaurant scene has kicked into high gear in the past couple of years, churning out amazing new cafes, bars, and brasseries at an insane pace. We've rounded up six new places we're especially excited about right now. The Vancouver restaurant scene has kicked into high gear in the past couple of years, churning out amazing new cafes, bars, and brasseries at an insane pace. There's enough new spots in the British Columbia city to keep you busy for weeks, but we've rounded up six new places we're especially excited about right now. Inspired by their love of the German street snack currywurst, friends Clinton McDougall and Dane Brown crowdfunded this tiny, bright spot in Vancouver's Chinatown. In addition to classic bratwursts, the duo serve elk sausages, house-baked pretzels and mustardy potato salad alongside wine on tap and meat-friendly beers like Driftwood Crooked Coast Albier. 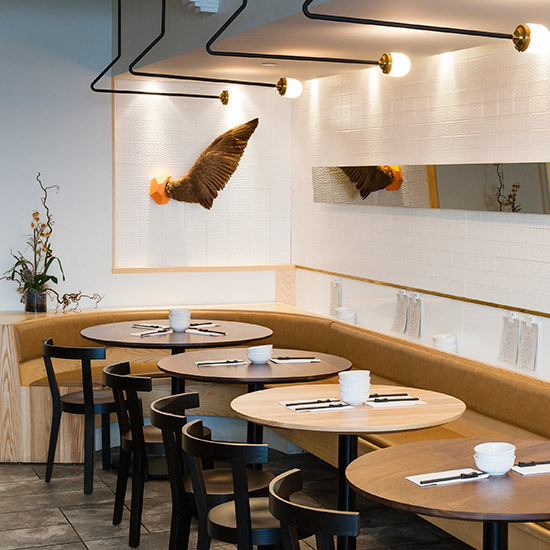 Pidgin’s modern dining room (photo) might seem stark if it weren’t for cheeky design nods to the restaurant’s name, in the form of beer taps shaped like poultry legs and a sculptural wing dangling from one wall. Chef Makoto Ono grew up in Winnipeg before cooking for Jean-Georges Vongerichten in London and running his own restaurants in Hong Kong, experience that shows in his refined but comforting dishes like beef brisket with a miso gorgonzola crust. Thin, crispy-edged Neapolitan style pizzas are the focus of this new pizzeria, with a concise menu of 10 pies, a handful of snacks and a rotating selection of desserts in jars (think tiramisu), which they will send home with you for an extra buck (to cover the cost of the jar). Try the Puttanesca pie with anchovies, capers and olives. Everything is picture perfect at this tiny Japanese café, from the shelves stocked with knick knacks to the matcha madelines and lattes. If you’re in the mood for something savory, they offer daily lunch specials of dishes like teriyaki pulled pork, beautifully arrayed with soup, a sweet and a cup of tea. Located in the center of Vancouver’s hip Gastown neighborhood, Bambudda specializes in modern Cantonese small plates like tea smoked duck with plums and sesame crackers and a red prawn toast with a squid ink emulsion, a genius reinvention of the ubiquitous takeout snack. The entire front wall of the restaurant opens to the street on nice days, giving the neighborhood a peek into the gorgeous mid-century modern dining room. One of the doughnut-obsessed owner’s of Vancouver’s 49th Parallel Coffee Roasters went on a pastry-class bender to learn how to make his ideal version of the classic pastry. The results, which include a salted caramel old fashioned, a coconut cream filled doughnut topped with Swiss meringue and an apple bacon fritter, have been selling out since Lucky’s opened last year. There's now two outposts, tucked inside 49th Parallel shops.